You know how sometimes you know you will just love a book even before you start it? It was that way for me with Jennifer Ashley’s Death Below Stairs, the first in the Kat Holloway series. Fortunately, it did not disappoint. I loved Kat Holloway right from the start, a young cook, who takes her job very seriously. She is assigned to a new household and hopes to stay for a while. Only a master who doesn’t respect boundaries and the murder of her assistant cook, have her doubting that will happen. There was so much to like about this Victorian mystery: mystery and intrigue, a budding romance, and interesting characters. The more I got to know Kat, who is mysterious in her own way, keeping her secrets close to her vest, the more I liked and respected her. And I adored Daniel McAdam, the man who seemed to be able to do just about anything. He is the biggest mystery of all—a man of all trades, able to play the role of working class or gentleman. Even Kat, who he seems to fancy, doesn’t know what to make of him. Somehow she trusts him though, despite her reservations. It is he she turns to when she discovers the murder victim in the food pantry, and it is he she leans on when she needs the support of a friend. Another character I quite liked was Lady Cynthia, the sister-in-law of the master of the house. She is unconventional in every way, preferring to wear trousers over dresses, and sneaking into men’s clubs with her friends. She proves to be more than just a rebellious socialite. I was expecting a straightforward historical murder mystery, but I got so much more. Who exactly killed Sinead, no one knows, but there are plenty of theories. Did it have something to do with the recent terrorist attacks in the country or was it a case of blackmail gone wrong? Kat figures she is in the best position to find out along with Daniel’s help. The novel ended up going in a direction I hadn’t expected—and which could have thrown the book off the rails—but it didn’t. I loved it all. To learn more about Jennifer Ashley and her books, please visit the author's website. You can also find the author on Goodreads, Facebook, and Twitter. Suzanne - I do recommend this one if you get the chance! I'm hearing some good reports about this book. Will keep it in mind and glad it worked so well for you! Kay - I really enjoyed it. If I had done a top ten list this past year, I'm sure this would have been on it. I suspect a lot of people will enjoy this one! Kathy - I hope so! It's so good. Eustacia - I hope you enjoy it if you read it. I really enjoyed it. I like the sound of the characters and their backstories. I love a good historical mystery! Jenclair - I really liked that about this one. I have to get my hands on the prequel story! 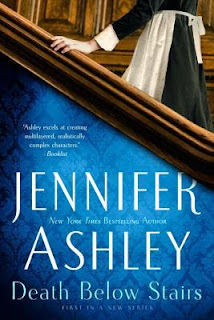 Oh, just remembered that Jennifer Ashley writes the Regency mysteries (Captain Lacey) as Ashley Gardner. I've really enjoyed that series. Jenclair - I think I saw that! I will have to check her other work out. Nice that it went in a different direction at one point and didn't ruin the story. I've been seeing this one around and haven't read a Victorian era country house mystery in ages, so I'm thinking of reading this one soon! Greg - I hadn't expected it to take that turn, but it fit well once all was said and done. I couldn't help but think of Tessa Arlen's series as I was reading this one--although it's completely different. And of course a different time period. I hope you do enjoy this one when you read it! Lark - I hope you like it when you do! So glad to hear this was a winner! I remember being interested in this one based on the cover alone. So glad it didn't disappoint and I'm looking forward to it! This book sounds good, Wendy. I'll have to keep this book in mind for my future read. Melody - I hope you are able to read it someday! I think that every review that I have seen for this book has been great. I noticed that my library has a copy of the audio so I will probably try to grab that and work it in soon. Carole - I don't think I've seen a bad review of this one yet either. I am sure someone out there will not have liked it as much as the rest of us. :-) I hope you like it if you read it! This sounds good reminds me of Downton Abby. Ellen - Yes! I thought a bit of that while I was reading too. Slightly different time period, but some similarities. Glad you enjoyed it so much, I keep seeing this one around. Naida - It has been getting a lot of good buzz. I'm just glad I enjoyed it so much! I LOVED this one! I think I enjoyed all the behind the scenes stuff almost as much as the mystery part. I was the same way about feeling like I was going to love it before I even started it. I'm glad it lived up to our expectations! Katherine - Me too! This was such a fun book. I can't wait to read more.